[Pendleton, S.C.] The Ceramic Tile Education Foundation (CTEF), working in conjunction with Schluter Systems, LLP, recently conducted the first hands-on testing of the Advanced Certifications for Tile Installers (ACT) program for open shop tile contractors at the Schluter headquarters in Plattsburgh, N.Y. 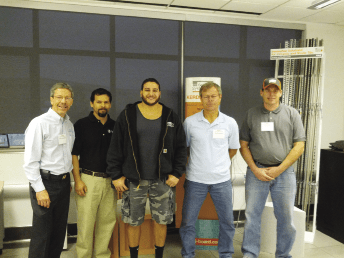 The installers taking the ACT tests first had to be recognized as having successfully completed the CTEF Certified Tile Installer (CTI) testing of their skills and knowledge. During the two-day testing, the pre-qualified CTEF Certified Tile Installers demonstrated their hands-on abilities in the following skill sets: Large Format Tile and Substrate Preparation, Membranes (both sheet and liquid), Mortar Bed (Mud) Floors and Shower Receptors. Prior to taking the hands-on portion of the ACT test, each installer was required to successfully complete the online knowledge test proving their command of the test subject. Successful ACT installers are then listed on the CTEF website, providing potential clients with a pool of talented and qualified tile installers. These installers now meet the specification requirement calling for Qualified Labor as shown in the Tile Council of America (TCNA) Handbook and many architectural specifications. The call for the use of Qualified Labor on job sites under section 9300 Ceramic Tile specifications is growing, according to CTEF. The ACT certification program provides both residential and commercial consumers with the confidence that their project will be completed correctly.